Relate: Imagine yourself a lonely traveler on the road heading from Jericho to Jerusalem. It’s a war torn land. All the wells have been stopped a few years back to keep the invader from having easy access to water. Combine that with the foraging done by the Babylonians when they did arrive and there is nothing. The land is desolate. And off in the distance heading towards you is a dust cloud. Thinking it is the army and not wanting to be pressed into labor you quickly get off the road. From the vantage point of a nearby hill you see that it is the army… well, kind of. There are some soldiers but far outnumbering of them are captured Hebrews. This is the beginning of the forced resettlement of an entire nation. Marching in a bedraggled line are thousands of thousands of beaten, downtrodden men and women and children. They are little more than slaves in chains. Then a few miles off in the distance, you see someone shouting something from horseback. You cannot hear what he is saying but you strain to hear anyways. Apparently he is shouting out something he is reading from a scroll. After a bit he finishes up and starts galloping in your direction. It is the oldest son of Shaphan, a former advisor of the last great king, Josiah. What is his name again? As he reads out the letter something inside of you boils with rage. These Babylonians are an evil people. They sacrifice their children in the fire. Their city is a cesspit of filth and all kinds of unspeakable evil. You have seen the product of what the army does when moving through a village. You can see around you the result of this war on the land. You can see before you the atrocities they do to the people themselves. The Babylonians do not just conquer land. They destroy cultures. They take the best and the brightest for themselves and then move almost everyone else to various distant lands to ensure that there will never be a threat from that people group ever again. 70 years. Captives. That’s the context in which we found this most beautiful of truths. God is far more interested in our position than in our circumstances, and the position He wants for us is to be right next to, and completely dependant on Him. That is our future. That is our hope. God do whatever You want to do with me. If that means allowing me to go into captivity, bring on the chains. Whether in good times or hard, whether in worldly success or failure, the most important thing is that I am pursuing after You. Help me to want that more. Strip away any other desires that might be pulling away from that goal. Be my only hope. You are my only future. Powerful message. I bravely pray that too. As with Habakkuk, God is working, we must run with the vision, we must walk by faith, and we must praise Him no matter what the circumstances look like. What a brilliant post, BJ. As I read this that number and that word stayed. 70 years is beyond my lifetime. Probably my children – if not towards the end of their lives. We are not just talking a number, we are speaking of generations passing. What would I do, think, be and become? Who knows. But a very worthwhile ponder for the days or weeks when He seems distant. Thank you. I like the way you put it in context. It’s about captivity. It’s rather coincidental. Last night I was caught up in a bout of near depression as I thought of some to the things that have been around rather too long in my life. Things I want gone. As I lay in bed sulking the words of this verse just started singing in my head. I immediately knew what was happening. God was comforting me. The heavy burden just lifted and I had to ask God to forgive me for getting angry at that situation. 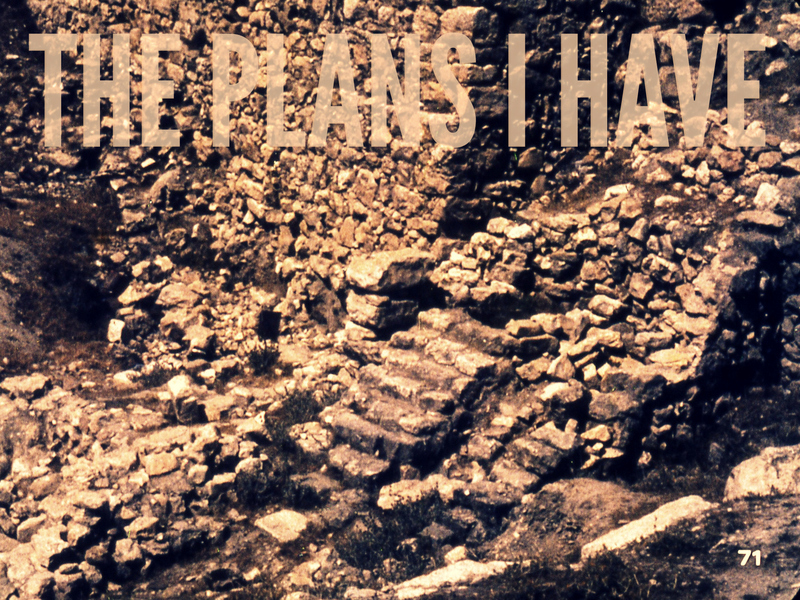 He indeed knows the plans… better than we do. Thank you sharing at such as time as this~ truly you ministered to very core of what I needed ~ BLESSINGS! This message, came to me at such an appropriate time! Thanks be to God! It requires faith to stand on His word that He has a plan for us, especially when we cannot see what is ahead. Yet that is what is required of us – faith in God and His word. Reblogged this on The Ambassador's closet. Thank you. Feel free to come back anytime. My all time favourite verse! Great message here. I must become less that He may become more. Thank you! Beautiful and brilliant. The message was so full in the voice of a true child of God. Thanks for this timely post that ministered to me with laser precision. I appreciate your setting the context for the verses that have become so popular these days. As always, thanks for your insight and thoughtful expression of the truths of the Word of God. Again, the song at the end was perfect–so touching. Hhmmm. Interesting. I’m doing a teaching tomorrow using this same scripture and same basic point. It’s not about circumstances. It’s about our will becoming one with his. Our trust of his love and wisdom. But is the church even now seeing a movement of those making a journey back to Jerusalem, and those happy to stay in Babylon? This is a very pleasant post. Thank you. I like the Proverbs you attached.